The machine has achieved overwhelming high productivity as a result of achieving high acceleration and quick response. In particular, Z-axis acceleration has been greatly improved, which is highly effective for improvement of productivity. As the Z-axis moves most frequently, Z-axis acceleration has been improved to twice the former model. The X/Y-axes optimal acceleration setting function sets the most appropriate acceleration according to the table loading capacity. * Acceleration for the S500X1. The loading capacity needs to be set via parameter. Delay in response has been reduced to almost zero by increasing the responsiveness of the servo motor. For example, high-speed synchronized tapping at the fastest level in the world is completed within much shorter time. Brother's original NC unit thoroughly eliminates waste motion and waste time, and drives machine performance to the fullest to demonstrate high productivity. 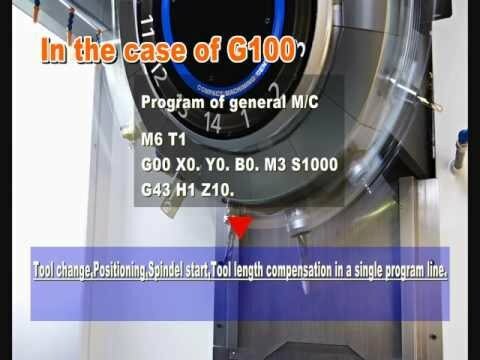 Tool change time is minimized by optimizing the magazine operation and improving the Z-axis acceleration, in addition to the shorter start and stop time of the spindle. Further reduction of waste time achieved by positioning X/Y and additional axes simultaneously with tool change. Technologies accumulated over years to enhance machine rigidity, and use of a high-power spindle motor allow the machine to demonstrate its broad machining capabilities from high-speed, high-ef¬ciency machining to heavy-duty machining. Based on accumulated analysis technology data, the machine uses a structure that effectively further improves its rigidity. High-accuracy machining has been achieved by improving machine rigidity, renewing the control system using a new NC unit, and adding new functions. Stable accuracy for circular machining and three-dimensional machining has also been achieved. Resolution of the encoder has greatly improved and various offset functions have been added. These improvements achieve high accuracy for circular machining and pitch machining. The machine structure used is not easily affected by heat expansion due to coolant. High-speed and highly accurate three-dimensional machining has been achieved by high-speed spindle specifications and Brother's original three-dimensional machining control, such as the 200-block look-ahead function and smooth path offset function. The machine is equipped with the CNC-C00 series next generation NC unit with greatly improved processing capabilities and functions, and enhanced usability. Equipped with 'shortcut' keys to quickly open the desired screen and 'sub folder' to make program management easier, in addition to the USB memory interface, menu programming and tap return function. High capacity program data can be transferred via Ethernet at high speed. The simple production monitoring function is also available allowing you to monitor the machine's status. Equipped with machining support functions, such as torque waveform display,high accuracy mode, and heat expansion compensation system. Equipped with motor insulation resistance measurement, operationlog, and maintenance notice function. Standard equipped with PLC. Input and output points can be extended to up to 1024 points each (Optional).